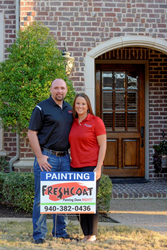 Recently opened Fresh Coat Painters of Denton serves Denton, Little Elm, Argyle, Lantana, Hickory Creek, Corinth, Aubrey, Lake Dallas and the surrounding areas. When Bret and Lacey Mitchell decided to pursue their long-time dream of business ownership, they knew they wanted something that would help them put down roots in the DFW area while improving something people in the community need. That’s why they recently opened Fresh Coat Painters of Denton – to bring a new standard of excellence to the local painting market. Fresh Coat offers residential and commercial painting services including interior and exterior painting, wood staining and finishing, and other services for nearly every protective coating application. They use quality, environmentally safe materials and offer a 24/7 customer service center, online scheduling, in-home color design consultations and detailed quotes. Fresh Coat Painters of Denton serves Denton, Little Elm, Argyle, Lantana, Hickory Creek, Corinth, Aubrey, Lake Dallas and the surrounding areas. Fresh Coat is committed to quality products and services and the company offers a 3-3-3 customer service pledge, so calls will be answered by a live person within three minutes, a quote will be delivered within three days (customer schedule permitting) and the job will be started within three weeks. Before opening this business, Bret, who was in senior management, seemed to be traveling more than he was home. Lacey continues to work 30 miles from home in medical staffing and scheduling, but having Bret closer to home means they get to spend more time together and in the community. “We always aspired to be business owners and we knew we wanted to stay in the DFW area. We came to a point in our careers that we knew it was time to act on our dreams. That’s when we learned about Fresh Coat Painters and knew it would be a great fit. The nice thing about going with Fresh Coat instead of doing it on our own is that we have the support of a corporate team and more than 100 active owners nationwide. That’s great for us, but it’s also valuable for the clients,” Bret said. Fresh Coat was founded in 2004 as part of Strategic Franchising Systems. In the last year, Fresh Coat has been included in the Bond’s Top 100 and named to Entrepreneur Magazine’s Franchise 500 list. Fresh Coat is also part of the International Franchise Association, the Small Business Association’s Franchise Registry, VetFran and Minority Fran. All Fresh Coat employees are trained, dependable, fully insured and background-checked. In addition to starting their new lives as business owners, Bret and Lacey are looking forward to becoming more connected to the community they call home. “We are North Texas residents and we hope this business will give us the opportunity become more involved in the community. This is our home and we want to be here for a long-time, so we’re excited about opening Fresh Coat of Denton here,” Lacey said. For more information about Fresh Coat Painters of Denton, call (940)382-0436, email BMitchell(at)FreshCoatPainters(dot)com or LMitchell(at)FreshCoatPainters(dot)com, or visit http://www.FreshCoatDenton.com. With more than 120 locations nationwide, Fresh Coat Painters brings quality customer service, top-notch painting products, professionalism and affordable pricing to the residential and commercial painting industry. They use quality, environmentally safe materials and offer a 24/7 customer service center, online scheduling, in-home color design consultations, and detailed quotes. All painters are bonded and insured employees. For more information, call 1-855-FRESH-COAT, or visit us on Facebook. The company was founded in 2004 as part of Strategic Franchising Systems. In the last year, Fresh Coat has been included in the Bond’s Top 100 and named to Entrepreneur Magazine’s Franchise 500 list. Fresh Coat is also part of the International Franchise Association, the Small Business Association’s Franchise Registry, VetFran and Minority Fran.